In the early days of experience optimization, and still often today, the common starting point for design were hypotheses—or clearly stated ideas about solutions. Some produced great return on investment. Others did not. Why is this? Having considered thousands of hypotheses and the results in testing them, we noticed an unassailable trend. There are physics principles at play in user experience optimization: Value is created in direct correlation to the size of the problems solved. Quite simply, the ROI goes up when the volume of problems goes down. Problems are the fulcrum for good solutions. Ideas are plentiful, but well understood problems are rare. This recognition can change an entire business. 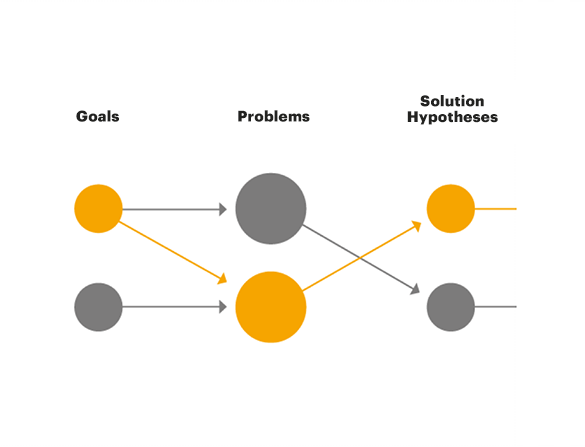 Ideas—hypotheses—only deliver sustained value if they solve a problem. In order to keep all of our efforts—from UX to product to content—focused on solving customer problems and delivering business results, we created a unifying methodology for experience optimization: Problem Solution Mapping (PSM). PSM helps an organization apply the physics of ROI to their business by organizing around a common set of goals, problems, and solution hypotheses that are researched and validated with data. Not every problem can be solved, but PSM ensures that we address the most important and impactful ones—the problems most worth solving. In doing this, we create happier customers and confident, measurable business results.